Cytech is pleased to introduce the new KNX/Logic Processor. The KNX Logic Processor is an Automation Controller with a KNX Interface which can work with other Cytech interfaces including CBUS, Z-Wave, GSM, Modbus, Velbus, IRIO, HIO Hotel I/O. KNX/Logic is applicable to an automation system which does not require the Comfort Intruder Alarm, but has the same capability of Comfort for Responses, Time Programs, Timers, Counters, Flags, and Sensors. It does not have the Voice recording/playback, voice menu, dial out, and telephone interface of Comfort and does not have any inputs and outputs. Scheduling with 32 Time Programs. 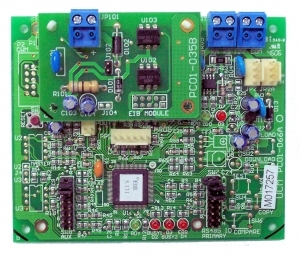 Synchronise KNX/Logic real time clock to KNX devices. KNX/Logic has automatic Daylight saving adjustments and Sunrise/Sunset times based on locations. The optional UCM/ETH03 module is synchronised to Internet Time Servers. Power Supply 12V to 15V 1A wallmount universal adaptor 90V to 240VAC with UK, EU or US plug. The KNX Bus is isoolated from KNX/Logic voltages. Control Menu – 8 Control Groups, each with 10 control keys, each control key has 10 Action keys. 64 Timers for programmed delays 1 to 65534 seconds. Connected to KNX Bus via bus cable (2 wires). KNX to Comfort allows 256 Group addresses to be mapped to Comfort. The KNX/Logic has a built-in KNX Interface.The KNX/Logic can be used to connect other Cytech modules in a system, eg UCMs, IRIO, HIO and link them by mapping to Flags, Counters and Sensors. For example, an IRIO with ISM03 Infrared submodule is used to control up to 4 airconditioners or AV systems using IR signals. Setting the flag turns on the appliance and clearing the flag turns it off. These appliances can be mapped to Flags or Counters in KNX/Logic. These appliances can be controlled by KNX and other systems by mapping the required group address to the same flags or Counters. On/off states can be mapped to Flags. Setting the Flag controls the appliance according to the Flag state, ie 0 for Off, 1 for On. In IRIO, another flag can be assigned to the feedback status. This flag can be mapped to the KNX group address (or other system) to give feedback. Counters are used when the state is not binary or On/off. An 8-bit counter has 256 states from 0 to 255 which can represent dimming levels for lights. Mapping to Counters allows dimming or analog levels to be passed from one system to another. A new value sent to a Counter will also trigger a Counter Response which can be used to apply Logic conditions which could set the values of other counters and flags. KNX EIS5 (2-byte floating point) objects can be mapped to KNX/Logic Sensor Registers, which activate Sensor Responses based on the value of the 2-byte object. Time Programs can be used to schedule commands or scenes for controlling devices. Logic If/Then conditions can be used in Responses for conditional programming. The Comfort apps can be used to control and monitor the KNX/Logic by programming the Control Menu. Note that KNX/Logic cannot be used together with the Comfort Alarm/Automation system or UCM/Logic Controller in the same network as they all work as controllers on the Cytech RS485 Bus. Responses are programs consisting of Actions or commands which perform customised tasks; eg Control Outputs, send Infrared signals (Outputs require IRIO), control Flags and Counters, start and stop timers for delays do complex Conditional Logic which depends on Time, date, Sunset/Sunrise, Counters, Flags, timers, Inputs, and Outputs. I think this is a great addition to your product line especially installations which do not require the alarm functions. Welldone. DIN-Rail mount will be very wellcome here in Europe. Is there a device file associated with this logic module? Currently when programming KNX we use a GIRA dummy device to signify Comfort within KNX. In order to make this more accessible and familiar to KNX programmers would it not be a good idea to register the Comfort as a KNX product and then create a downloadable device file that included comfigurator for KNX logic. In this way KNX installers and programmes would find the Comfort logic module a lot more convincing!